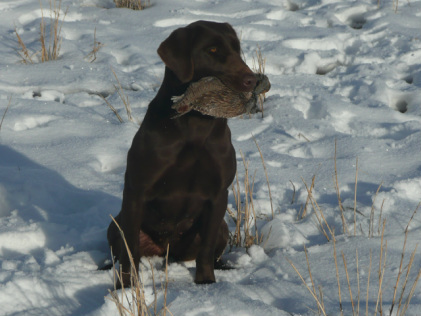 Tala means "Wolf" in Indian and she is our little chocolate hunting "wolf" here at Utah Pointing Labs. Tala comes from strong pointing, hunt test and field trial lines. Her dad has the strongest and most decorated Chocolate Male of any in the country. Her parents are 3XGMPR The Cptn's Sierra Shaddow Mountain Ale MH QAA (Porter) X CPR High Caliber's Elusive Stash (Avery). Tala has a great personality, she is calm and loves to be around people, but when it is work time the great breeding and hunting lines come out! She is hard charging retriever and likes to point a long ways off. She has a incredible nose, good drive, good marking ability, point, and trainability. Tala is easy to handle on blind retrieves and is a dog that is easy to work with and she likes to please. She is truly one of the nicest chocolate females out there in the pointing lab world. Tala passed her Certified Pointing Retriever title spring of 2013 at 8 months of age. We plan on running Tala for her MPR and GMPR fall of 2014. Tala also knocked out her Senior Hunter title Spring of 2014 and is now titled with both the AKC and APLA showing that she is a dog that can play in both arenas. If you are keeping your eye our for a chocolate pointing labrador puppy in the near future, keep an eye out for puppies from Tala.